ruthdelacruz | Travel and Lifestyle Blog : Go Nuts Donuts Celebrates 10 Years with 10 New Donut Flavors, Cronuts, Raffles and More! Go Nuts Donuts Celebrates 10 Years with 10 New Donut Flavors, Cronuts, Raffles and More! When I received the invite for Go Nuts Donuts' 10th Year Anniversary launch, I literally jumped - out of excitement and amazement. I know, I sometimes over-react to things - but the invitation served like a ticket that brought me back to 10 years ago - I remember people lining up at the Go Nuts Donuts The Fort for hours just to bring home boxes of the sweet goodies. What is your favorite flavor? For me, it was the Pastillas de Leche! But now, I got new favorites! Read on.. The brand continuously offers new innovation, from sugar-free donuts (for diabetic peeps) to partnership with Highland Coffee in 2012. On its 10th year, Go Nuts Donuts has a lot of new things to offer.. First off, 10 New Flavors! Click Read More to know the new flavors.. Strawberry Sunrise, Green Tea, Peanut Butter Caramel, Chocolate Mint, Hazelnut Crunch, White Chocolate Glaze Lite, Sea Salt Caramel, S'mores, Mocha Lite and Lemon Curd. This new flavors will be available on December 1, 2013! I love the Smores and the Sea Salt Caramel. The Lemon Curd (below) is also good. Not your usual sweet donut! Go Nuts Donuts also offers its very own - Cronuts! 6 Flavors of huge and flavorful cro-nuts. Strawberry Jam, Apple Cinnamon and Blueberry Cream Cheese. I love the Blueberry Cream Cheese! I love the contrast of sweetness and salty kick of cheese! They are soft, chewy and very filling! I shared some with my co-workers and they sure love it! During the event, there was an endless supply of donuts and Cronuts! I raised the white flag and told myself to stop. I wish I could bring home the donut crates! Go Nuts Donuts team sure know how to spoil us! We got to bring home some good food to share with our family and friends! But wait, there is more from Go Nuts Donuts.. the store also released their very own Cookie Butter spread! It is good unlike the other spreads available in the market. Php200 for 300grms is a good deal. Go Nuts Donuts also have this Brownie Brittle! Very innovative snack! Do I make you crave for some delicious Go Nuts Donuts? Here's the real treat..
Go Nuts Donuts will be raffling off winners everyday! 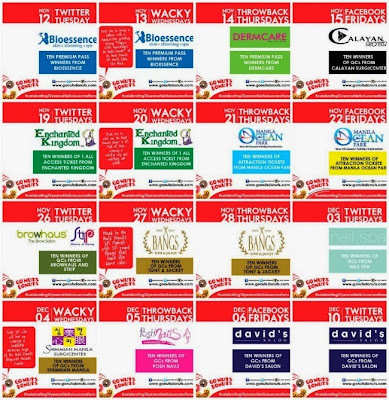 Social media fans and Go Nuts Donuts lovers will get a chance to win exciting gifts from Bioessence, Dermcare, Calayan Secrets, Enchanted Kingdom, Manila Ocean Park, Bangs by Tony and Jackey, Nail Spa, Posh Nails, Simmian Manila and David's Salon. 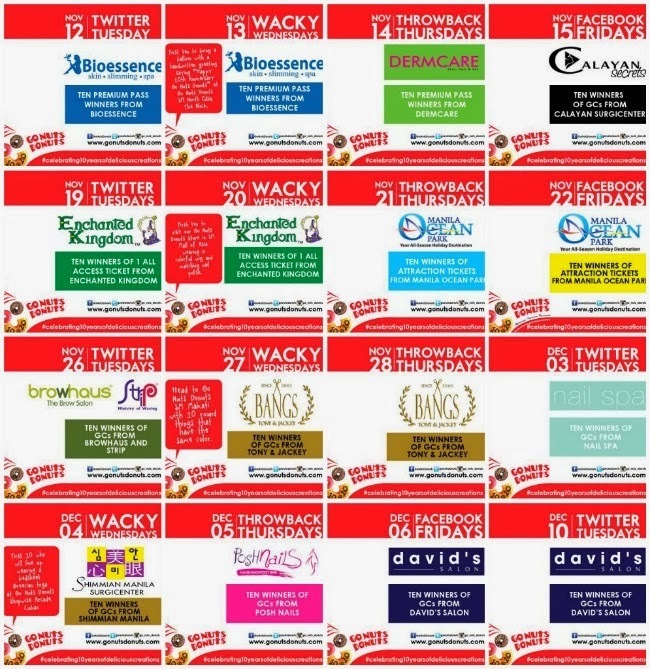 Check out and participate in the #TwitterTuesday, #WackyWednesdays, #ThrowbackThursdays,and #FacebookFridays promos! Thank you Go Nuts Donuts for making me a part of this launch. Cheers to 10 wonderful years, and more power! What is your best memory about Go Nuts Donuts? What's your favorite Go Nuts Donuts flavor? © ruthdelacruz | Travel and Lifestyle Blog : Go Nuts Donuts Celebrates 10 Years with 10 New Donut Flavors, Cronuts, Raffles and More!